The text in Part I was written, in French, at the end of 1979, it means nearly 30 years ago. It was during the period of author’s scholarship in bio-evolution science, under the tutelage of famous French zoologist, paleontologist and socially engaged writer Pierre-Paula Grassé, in organized by him Laboratoire d’Évolution des Êtres Organisés at the University Paris VII. Despite that this text stirred interest of several French biologists (in particular of Francis Jacob, a Nobel Prize Winner, together with J. Monod and A. Lvoff in 1965) it wasn’t published in philo-scientific journals. The “conspiracy of silence” of ambitious geneticians, combined with ugly egoist interests of pharmaceutical corporations, is prohibiting the honest discussion of fundaments of physiological reactions of living beings to incessantly trying to damage them environmental challenges (see the mentioned above “Newsweek Polska”, 2008). In this, virtually unchanged since roughly half century situation in bio-sciences, the author, profiting from the free time he has now thanks to his new status of an academic professor emeritus of philosophy, has returned to “dark affairs of life sciences”, which unwelcome by Neo-Darwinians subject he investigated in Geneva, Paris, and finally in Poland for whole two decades from mid 1970ies till mid 1990ies []. The deconstruction of Neo-Darwinian Super Dogma, inhibiting the public to see that living beings actively, at the genetic level, cope with challenges imposed by Natural Selection [], will of course change entirely our understanding of supposedly “ineluctable” processes of technicization, economization and “monetarization” (mammonization) of the earth terrorized by so-called “homo sapiens”. If we compare results of numerous experiments done by ophthalmologists, which indicate that young mammals need the stimulation with light in order to develop fully their organs of sight, with the known phenomenon of hereditary atrophy of sight among animals dwelling in caverns, it is for us natural the explanation of this second fact by a hereditary fixation of the first one. What was my astonishment when I discovered that such causal relation is categorically denied by contemporary life sciences: no tendency, whatsoever, for hypertrophy or atrophy of phenotypic (it means, visible during the life) characters, can be transmitted to subsequent generations. Being grown, since already two generations, in a scientific environment, I was not able to hinder myself from forming a preconceived idea: how scientists were able to prove such a theory? Surely they were cutting tails of cats in order to prove it! Only later, thanks to historical research, I become able to verify that not only tails cut of nearly thousand mice have served, as a satisfactory proof, of the most fundamental theory of life sciences, but also that these tails still remain the unique proof of this theory validity. It is known from history that all problems with understanding of biology began with the testament of ‘father’ of this science, Chevalier de Lamarck. (J. B. Lamarck, simultaneously with Trevirianus in Germany, at the beginning of 19th century created the word “biology” and dictated a part of his works as a testament.) Sensitized by the “affair of cut tails” I was searching in vain the history of inheritance of amputated tails in two tomes of his “La Philosophie zoologique” [], which was published for the first time in 1809. Only in one place of this book Lamarck quotes the case of a person, which since a long time had his leg amputated, but nevertheless this person felt rheumatic pains in this not existing limb. It is necessary to underline that considerations of Darwin on “inheritance of mutilations” are completely marginal: only two pages and three references, among them only one judged by Darwin “trustworthy” and subsequently confirmed (experiment of Brown-Sequard, Weismann , pp. 356-360). “Charles Darwin has not admitted the principle of Lamarck without examining it in a depth; he wanted to see, by facts he had in front of his eyes, whether modifications which an exercise introduces into the life of an individual, can really be transmitted into his progeny. Several data concerning the presumed inheritance of mutilations have appeared to him, in particular, if not to prove directly this phenomenon, to make it at least more likely. And he has come to a conclusion that one has no sufficient reasons to question the inheritance of acquired modifications. Due to this, the use and disuse play in his works, as direct factors of transformation, an important role alongside of natural selection. Following this reasoning we can deduce: a mutilation is a somatogenous acquisition, which means that it comes from the body… so necessarily in Weismann experiments mice were mutilating themselves their tails! I. “Semantic confusion” between mutilation (an introduced from outside injury) amd mutilation (an immediate effect of this external intervention) is pardonable due to the lexical poverty of our language. II. “Cognitive confusion” is a very serious error. 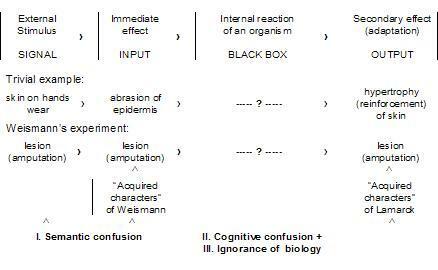 Mutilations are for Weismann “simple reactions of a body against external aggressions”. In case of his experiments a mutilation (an injury introduced from outside) = mutilation (reaction of a body to this injury). In cybernetic terms, in case the “input” signal = “output” signal, we say that the system has not reacted. The visible for certain time (especially in the case of higher animals), lack of adaptive reaction become confused with such reaction. “If a finger of a man is cut, his deprivation of the fifth finger is a somatogenous or acquired character; if a child is born with six fingers, the presence of the sixth finger has resulted from a particular constitution of the germinal cell, which means that it has a “blastogenous” character.” And if the finger which was cut-of, regenerate, would it be “acquisition” somatogenous or blastogenous? Moreover, it is not a hypothetical question, but a real one, even in humans, especially in the case of mutilation of these supplementary fingers (Darwin, pp. 14-15). If we are able to detach ourselves from myths, which have accumulated around heredity in the last century, THE SEXUAL REPRODUCTION IS SIMPLY THE REGENERATION OF THE WHOLE INDIVIDUAL FROM ITS SEMINARY CELLS, which regeneration is enriched by all benefices of sexual crossbreed. (The parthenogenesis of certain animals is the simplest example of such regeneration.) In case, when seminal cells – and especially their nuclei – are not affected by an injury, they reproduce an individual without a possibility of a transmission to it injuries (primary effects) resulting from external circumstances. If we know a little the biology, the non inheritance of somatic mutilations is proved à priori, by a very definition of living beings (see the P.S. 2008). But the problem of inheritance of phenotypical adaptations (for example the overproduction of blood in frequent blood donors, or the hypertrophy of skin layer, which is frequently torn out on hands and feet) remains open. The scheme below (fig. 3), patterned after models used in the “theory of catastrophes”, elaborated in 1970ies by a mathematician René Thom, permits an elegant illustration of the “mind catastrophe”, thanks to which become possible to “prove” that efforts (or lack of such efforts) of parents (and especially grandparents) have not an influence on psycho-motorical predispositions of their progeny. Thanks to the progress of molecular biology we are able to put some light at “black box” containing the internal mechanism of adaptations. The hypertrophy (or atrophy) of any ‘somatic’, or ‘phenotypical’ (it means revealed during the growth of an individual in a particular environment) character, results from modification of ‘expression’ of genes, which ‘code’ the information “shaping” this particular character. The problem of a “genetic fixation” of phenotypical adaptations, which were repeated during several generations, reduces thus to an open problem: are also genes, which were/are frequently expressed (it means used) undergoing a hypertrophy (manifested by a increase of their numbers, for ex.) too? Lamarck’s theory predicts such a long term genetic reaction. In a context of these discoveries we should rather read inversely the message hold in the last sentence of Jacob: “Material means for a controlled modification of genetic texts amply exist. It is THE (FREE?) WILL OF SCIENTISTS, which forms the major obstacle for an acceptation of this possibility”. In this case references of Darwin do not begin with “one cow, which has lost one of its horns…”, as it was in the case of mutilations, but by (p.278) statements of the type “The great number of competent gardeners are agreeing at this point”. To these “pretended proofs” of inheritance of various adaptations it is worth to add the relatively sudden (“jump-like”), and retarded for few generations, variations of a plant Oenothera lamarckiana, which were observed at the end of 19th century by Hugo de Vries, during his lasting for 15 years experiments, which gave rise to the modern notion of “mutation” []. There were also successful experiments with hereditary adaptations of amphibians, made by Vienna’s zoologist Paul Kammerer, whose sad case described Artur Koestler in one of his last books, relating misachievements of modern bio-science [] (see the attachment ‘Kammerer’s experiment’). The putting into obscurity of so rich experimental data, published by most renown world’s biologists, is surely the most extraordinary adventure in the whole history of science. Nearly thirty years have passed, and we, as participants of a “global intellectual forum”, still are not able to “find a day, when we will be in a posture to get out from the extreme prudence, to which we are forced today, concerning the scientific domain,”, as remarked it elegantly M. Gauchet le 19 Mars 1980 (or 1981). How many more generations we are supposed to wait, until “authorities” of biology agree to accept the Newtonian 3rd Law that Action = Reaction? It is on the disregard of this Basic Law of Physics is founded the Worldwide Authority of (Neo)Darwinian Establishment. 2. Young Canadian enthusiasts of molecular biology Ted Steele and Reg Gorczynski, from University of Toronto, inspired by the mentioned above Arthur Koestler’s book  published in 1972, decided to check the veracity of the dogma of non-inheritance of ‘acquired characters’. Using the standard statistical method, they confirmed that “learned” by mice tolerance for specific antigens A/J, becomes in large extend hereditary, principally in “male” mice strain, and this inheritance is pronounced the most in 2nd, 3rd and 4th mice generation. Thanks to the recommendation of 1975 Nobel Prize Winner Howard Temin, their results were published in a prestigious “Proceedings of Natl. Acad. Sc. USA” []. 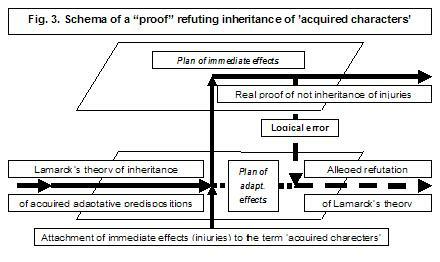 This paper provoked a quick reaction from believers in the non-inheritance of ‘trained’ dispositions. Thanks to a short letter I got at that time from Francis Jacob, I learned about subsequent experiments with tolerance of mice, which were done in London by Peter Medawear []. His experimentation supposedly undermined results of Steele and Gorczynski, but examining closely Medawear’s results I discovered that he has limited his study only to the first generation of mice born from tolerant parents, while already Charles Darwin, and than many researchers after him, including Swedes reported recently in “Newsweek Polska”, have noticed that “that in no one of numerous experiments the modification began to produce itself in the first generation”. It is of interest that the redaction of prestigious “Nature”, commenting in 1982 Meadawear’s control experiment, once again repeated the nearly century old Weismann’s Dummheit: “If a giraffe has achieved its long neck as a result of activities of its ancestors, so why not a woman, which has lost her arm, would not be able to give birth to a single handed child”. 4. As my own adventures with the scientific establishment are considered, I lost the possibility of continuation of my research in France, where my “negative selection” was personally signed by Pr. Jean-Pierre Changeux, the author of well publicized book “L’homme neuronal”. (In this book he announces his computer assisted, neo-Darwinian discovery “Apprendere c’est eliminer”, which indicates that learning consists of selective elimination, of superabundant in our young age, intra-cerebral connections). I sought than the “economic asylum”, not at Antipodes as did it Steele, but in the still socialist Poland in early 1982. There I was offered, in 1983, by the publishing house “Nasza Ksiegarnia”, a contract to write a book on history of evolutionary ideas. Despite a positive opinion of this book, written by my graduate teacher of nuclear physics (and than of medical physics) prof. Andrzej Hrynkiewicz from Jagiellonian University, the publication of this book was hindered by a local enthusiast of Neo-Darwinism, a zoologist from Warsaw University, dr Jakub Szacki, who summed up his official opinion in a following manner: “This work is full of false theories, misinterpretations, trivializations and serious errors. The author, using words of Lamarck, describe Darwinians as “unable to bind together three ideas” … According to the author Darwinism is responsible for arms race, economic competition, careerism, and everything which is the worst…”. Finally, only ten years later, in 1993 I was able to publish this “heretical” book, titled “Fallacies and Paradoxes of Modern Biology” []. I managed to do it thanks to a partial sponsorship of this book by my long term friend from Geneva, a mathematician and ski-alpinist Etienne Archinard. And the end of these remarks, which compilation was enhanced by my professional “retirement from science and philosophy” at the age of 66, I would like to point why dr Szacki and his like, usually matured in Judeo-Anglo-Saxo-Protestant (JASP?) cultural niche, so vigorously demand the concealment of results of any, not only of mine, research questioning the neo-Darwinian (mis)understanding of basic life processes. I have to stress, as a philosopher and educator, that the specific “enlightenment”, characterizing the Bible centered ‘JASP’s’ cultural niche, appears to be – especially in affairs related to methods of learning [ – more dark than darkness characterizing caves, in which imprisoned animals are losing with time their sight, which deficiency becomes fixed in their progeny. First. In my book I tried to popularize the opinion which I heard several times from my 1979 host and mentor in Paris, Pr Pierre-Paul Grassé (please, check by google this name). Namely that Darwin’s theory of evolution gives no information whatsoever why species evolved from less complicated ones towards more sophisticated and more differentiated taxonomic units. Natural Selection, by the very definition of the term “selection”, means not the creation, but to the contrary, the elimination, extinction of “negatively chosen” species. I have in mind here the extinction of not only eagles, bears and various types of panthers and tigers, but also the elimination of most pertinent in their research and judgements philosophers and scientists (Garaudy, Kammerer, Steele, and my friend dr Siegfried E. Tischler, who had to seek “ethics of science” asylum as far as Indonesia – please, check by google this last name). This sad reality of “negative selection” we observe very well in Global Tumor Organizing Centers of our, mercilessly “domesticated” earth. Third. In my book  from 1993, and in following it, compiled principally in English “Syndrome of Blind Watchmaker” , I demonstrated that the regeneration of “consumed” products of bio-synthesis is a chemically trivial, obligatory process, working on the same physical basis as the “revival” of an ordinary fire by removal of ashes (products of burning), inhibiting the access of air to not yet burned materials. And from this, imposed by the very mechanism of bio-synthesis, phenomenon of R – Regeneration, must result, in a chemically spontaneous manner, the well known phenomenon of SR – Super-Regeneration, otherwise known as over-recovery, or hypertrophy, of all products of biosynthesis, which are “consumed” (removed from their templates, used, alternated, or destroyed) during life activities of an organism. This pattern of obligatory biological reactions is visualized at the Fig. 2 of Part I, where “input” consist of various, externally induced injuries, irradiations and intrusions of foreign bodies called ‘antigens’. All of them are forming these Darwin, Weismann and Jacob imagined “imprints”. As an obligatory chemical reaction to these induced “imprints” we (with the exception of Darwinians) observe, at the “output” side of the “black box” of a living body, “exprints” in form of extrusions of bio-materials, which are automatically repairing damages caused by these ‘imprints’. In particular we have extrusions (secretions) of ‘antibodies’ neutralizing intrusions of alien antigens. In this bio-chemical manner, as postulated it Swiss biologist and psychologist Jean Piaget nearly fifty years ago, by a “majorant reequilibration” of its internal structures, a trained to live in a specific environment organism reaches a dynamic equilibrium with ever tending to destroy it environmental factors. It is an equilibrium not only with saturating the food and air bacteria and viruses, but also with trying to “flatten” us force of earth’s gravity. As stresses it professor of medical physics from Kraków, Andrzej Hrynkiewicz, an important role in keeping us in a good health play various, medium intensity irradiations, beginning from UV reaching us from the sun, and ending on α, β, and γ rays which emanate from the earth containing uranium ore deposits. (As says it an old Roman proverb “what hasn’t killed us, it strengthend us”). Fourth. People which are able, to use the term of Lamarck, to bind together three ideas – it means normal, bright humans, with the exception of (neo)Darwinian careerists – can quickly deduce that from the fact that ALL “consumed” products of bio-synthesis MUST undergo spontaneous regeneration and super-regeneration, the process “SR” (super)regeneration MUST also occur in case of all “used” nuclear acids (DNA & RNA). This phenomenon has been indeed very well confirmed under an ordinary microscope, in particular in case of chromosomes “working” during the bio-synthesis of muscular fibers, during synthesis of silk by silk worms, and of saliva of larvae of fruit flies. Moreover, we have a process of a genetic Association (“A”) of ‘used’ genetic segments, of initially non matured and thus “soft”, divided into ‘exons’ and ‘introns’, atrophic genetic structures, characterizing genomes of young tissues  . During such associative ‘re-construction’ of genes, after a ‘maturing’ exercise of a given tissue of an organism, the genetic base for the well known phenomenon of “memorization” of frequently repeated behaviors becomes spontaneously constructed. This psychosomatic phenomenon, called already by Aristotle “the slavery of habits”, and by modern psychologists “conditioned reflex”, facilitates enormously the adult animal life in an environment, to which these animals (and prior to them their ancestors) have been accustomed. Fifth. Of course, if we do not repeat exercises, to which our ancestors have predisposed us, large portions of DNA in our somatic tissues remain non-used, and automatically less frequently “checked” by special “repair enzymes”. Due to it, they are more prone to accumulate on them various defects. (Like it is observed in so-called ‘introns’, which are removed from ‘mature’ nucleic acids used for the synthesis of mature proteins). It means that we shall expect the appearance of various forms of malfunctioning of organs, which are not enough exercised by us (and earlier by our close ancestors). This implies that our own behavioral ‘laziness’ and our attachment to a comfortable dwelling, will surely have negative influence on the health of our progeny. It is somewhat funny that so-called professionals of biology (which out of fear to be “incorrect vs. authorities of PC” have learned to use only few neuronal interconnections in their brains – see the theory of professor Changeux), are individuals the most convinced that acquired characters are not inheritable. These men of apparent scientific and political success, usually bear on themselves glasses, dental prostheses, bypasses, heart stimulators, pills diminishing effects of schizophrenia attacks, and injectors of insulin, which are compensating ‘acquired and inherited’ effects of an extremely sedentary life to which they – and earlier their parents and grandparents – have compelled themselves in order to be successful members of a bourgeois society. But let’s return to the main topic of this report. The loss of capacity to distinguish between living and not living is without doubt a severe cognitive handicap, which is spreading like an epidemics in super-domesticated “JASP’s” dominated countries. A year ago, during a summer scientific seminar in Poland I heard, from an ambitious doctor of Warsaw University, that although in scientifically dominant worldwide USA there are discussed already 5 hypotheses of biosphere evolution, including the one named “Intelligent Project”, no one is interested in Lamarck’s (neither Piaget’s) concepts of evolution of species – which evolution is a product of these species specific behavior. The specific behavior of human species become limited – principally by JASP’s “missionaries” – to an unlimited economical, “easing the life” development. The realization of such “Intelligent Project” ever more resembles the limited to the consumption and proliferation, behavior of evolving towards malignity “humanoid”, microcephalous cancer. M. Glogoczowski “Open letter to Biologists”, Fundamenta Scientiae, 2/2, 233-253, Pergamon Press, Oxford, 1981. B. McClintock “The Meaning of Genome answer to a Challenge”. Science, 226, 792, 1984. Lamarck J.-B. „Philosophie zoologique” Paris, F. Savy, 1873. Weismann A. „Essais sur l’hérédité”, Paris Reinwald, 1892. Jacob F. “La logique du vivant”, Paris Gallimard 1970. Darwin Ch. „De la variation des animaux et des plantes sous l’action de la domestication” Paris, Reinwald 1868. Rostand J. „Aux sources de la biologie”, Gallimard 1958. Tonegawa S. et al. Cell, 13, 1-14, 1978. P. Slonimski, Cell, 22, 333, 1980. H. de Vries [in] L. Blaringhem „Transformtion brusques des êtres vivants”, Flammarion, Paris 1911. A. Koestler „L’etreinte du crapaud” (The Case of Midwife Toad), Calman-Levy, Paris 1972. E.J. Steele and R. Gorczynski, Proc. Natl. Acad. Science USA, 77, 2871, 1980. P. Medawear, Nature, 295, 242, 1982. Brack C., S. Tonegawa et al., Cell, 15, 1-15, 1978. M. Glogoczowski „Atrapy i paradoksy nowoczesnej biologii” (subtitle: The history of theories of differentiation –and de-differentiation – of living organisms), Kraków 1993. A good example how the developed in ‘JASP’s’ scientific culture, “revolutionary” concepts of learning are looking like, it is worth to quote a characteristic statement, taken from writings of the famous linguist Noam Chomsky. A digest of these truly “Prometean” works, announcing the end of toil of students trying to learn foreign languages, was published by the Institute of Philosophy of Polish Academy of Science in 1996, in a book symptomatically titled “Noam Chomsky’s Attempt Of Scientific Revolution” (Noama Chomsky’ego próba rewolucji naukowej”): “Essential aspects of our mental and social life, among them also the language, are determined as a part of our biological endowment, and they are not acquired by the process of learning, in particular by a training”. It is an utter cretinity. One may wonder how many foreign languages has learned our distinguished scholar by this “no training” method. M. Glogoczowski “Syndrome of Blind Watchmaker”, completed in 1998; in Dialogue VII the author gives a following definition of living beings: “Living beings must have the capacity of an automatic reconstruction of all its constituents. Once an organism loses this capacity, it is condemned to a death. We cannot even dream that we will be able to construct such (Descartes imagined) “living watches”, it would be like an attempt to jump over one’s own shadow: in order to reconstruct all parts of such a “machine”, this machine must contain in itself molecular templates – or “recipes” as calls it Dawkins – which are necessary for a reconstruction of all its parts, including these “recipes”. And no system can define himself completely within its own system. In short, a living being must be a meta-machine, an entity surpassing with its holistic properties an ordinary watch, but in all its details working like an ordinary watch.” See the entire text of “Syndrome” at http://markglogg.eu/?p=366 . I. Kant wrote in 1791 ”(…) In a watch a pinion is not producing an another one and even less a watch produces other watches, using for this another material; it is not replacing, by itself, its missing parts, and do not corrects errors of its first formation, with the help of other its parts; in the case it is deregulated it is not repairing itself, (while) all these things we may expect of organized nature, etc.”Kritik der Urteilskraft” Part II, Sect. I, § 65. This entry was posted in ENGLISH TEXTS, genetics of bio-development. Bookmark the permalink.